Our goal is to give you the best price possible and the best value for your money. Our Lowest Price Guarantee is simple - we will match or beat the lowest price on the internet. Call Toll Free 800-520-8525 or learn more here. Some motorcycles come with factory-installed options that make them feel and look complete from day one. But we understand that you want to get the most out of your ride. We get that you see a new bike as a project you can make your own. Are you looking to outfit your bike with high-quality, aftermarket accessories that redefine how it looks and rides? 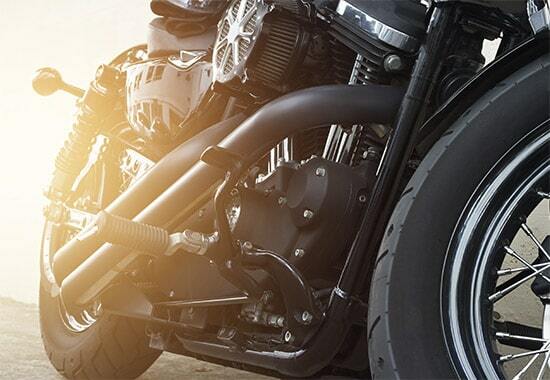 Whether you’re a lifelong diehard or you’re working on your first cruiser motorcycle, we aim to be your one-stop-shop for aftermarket motorcycle accessories, from exhaust systems to fairings, seats, chrome accessories, and more. Our cruiser accessories are designed for owners of motorcycles with v-twin engines. They’re good-looking, powerful, motorcycles designed for rolling down open roads. These companies make the best motorcycles around, and we’re happy to supply what you need. Whether you’re looking for a new seat, an upgraded exhaust system, windshield replacements, or you just need a new set of tires, we have the most reliable and competitively priced cruiser accessories for your bike. At West End Motorsports, we make it a point to lead the pack when it comes to service and quality. We always guarantee correct fitment when you call to place an order, ensuring you get parts that fit your bike perfectly. Even if you’ve already found the right cruiser accessories, our team is more than happy to walk you through installation, so you can focus on getting back out on the road. When you shop with us online, shipping is free for purchases $99 or more within the contenental U.S., orders can be placed online 24/7, and our streamlined deliveries can get you your parts and accessories in two days or less. If you’ve been looking to upgrade your bike with the best aftermarket motorcycle accessories, you can get what you want with speedy shipping right to your door. Exhaust upgrades, seats, mirrors, multi-item packages that come with everything needed to customize your bike, and more — it’s all here in our online store, ready to ship. For questions about parts or to place an order, please call us toll-free at (800) 520-8525, call us locally at (570) 992-1113, or send us a message through our contact form. We look forward to helping you upgrade your bike! No one gives you more exhaust system reviews than West End Motorsports. Direct and to the point videos allow you to compare the tonal differences between systems, in conjunction with an informed review of the system you're listening to. Dozens of top brands like TAB Performance, Vance & Hines, SVT Boneshakers, Bassani Xhaust, RCX Exhaust, Rinehart Racing, Cobra USA, S&S Cycle, and more, have been dyno tested and reviewed, making the tough decision of what system is best for you, a little easier.